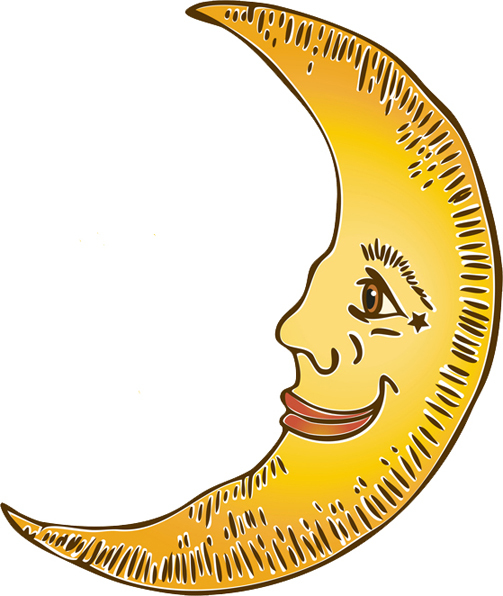 Watch for updates to our Kids-and-Books.com Blog. How fun to learn what our favorite authors and illustrators were creating when they were young! R.J. Palacio, Eric Rohmann, Brian Selznick … these are just three of the 26 authors and illustrators whose stories are shared in a book that’s scheduled to be published in July 2017: Our Story Begins: Your Favorite Authors and Illustrators Share Fun, Inspiring, and Occasionally Ridiculous Things They Wrote and Drew as Kids. Soon after his birth in Talbot County, Maryland, Douglass was taken from his mother and sent to live with his grandparents at another farm, 12 miles away. According to the book, Douglass’s mom made the long journey to see him just five times before she died. His Grandfather Isaac was free, but Grandmother Betsey was a slave. Douglass said, “Living with my grandmother, whose kindness and love stood in place of my mother’s, it was some time before I knew myself to be a slave.” She taught him to fish and spent lots of time with him enjoying nature. Born sometime in February 1818, Douglass eventually decided that February 14 would be his official birthdate. Douglass’s escape from slavery, his marriage to a free black woman (Anna Murray), his visits to Great Britain and Ireland – where he said “for the very first time in his life, he felt truly free” – all made for fascinating reading. Ladd’s powerful watercolor illustrations, teamed with Rappaport’s compelling narrative – along with Douglass’s unique story, make this book one that I wouldn’t mind owning in my own library. After the Civil War, Douglass continued fighting for the black man’s rights. “Slavery is not abolished until the black man has the ballot,” he claimed. Andrew Johnson, the president who succeeded Lincoln, didn’t agree, so Douglass traveled the countryside to try and convince others on this subject. Four years later, in 1870, the United States passed the 15th Amendment, giving black men the vote. 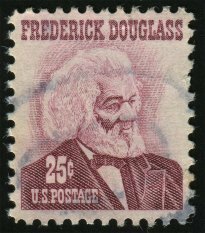 Following that event, Douglass lived another quarter of a century, passing away on Feb. 20, 1895, in Washington, D.C., where he and his wife of 44 years had bought a large home overlooking the Anacostia River. At the age of 28, Randolph Caldecott was already inspiring others in the field of art. He had just drawn a picture of two swans and a frog, in response to a 6-year-old’s collection of drawings that had been given to him. This short vignette appears on the first page of Leonard S. Marcus’s picture book about the famous artist, Randolph Caldecott: The Man Who Could Not Stop Drawing. Most of the images in the book are Caldecott’s own illustrations (color as well as black-and-white). He submitted illustrations to newspapers and magazines, quickly gaining recognition for his talent. Edmund Evans, a printer famous throughout England for producing illustrated books in color, admired the “casualness and freedom” of Caldecott’s drawings. He claimed that only Caldecott knew how to make a horse gallop on a page. From 1878 on, Caldecott completed two picture books a year for Evans. In 1879, Caldecott met his future wife, Marian Brind, whom he married in 1880. His travels through Europe continued to inspire his artwork; he especially enjoyed floating down the canals of Venice. In the years following Caldecott’s death at age 39 in 1886, other artists found inspiration for their own work in the books Caldecott left behind. Beatrix Potter saw him as a pioneer in the field of children’s picture books. A little over 122 years ago, a boy was born in Cambridge, Massachusetts. His name was Edward Estlin Cummings … later shortened to e.e. cummings. Kris Di Giacomo’s illustrations in enormous SMALLNESS: A story of E.E. Cummings are a fantastic complement to author Matthew Burgess’s writing style. Reading this book, I felt myself entering the world Cummings experienced as a child, and could easily imagine what it must have been like back then. I wasn’t a particularly big fan of Cummings’ poetry when I was young – the odd placement of letters usually bothered me too much so I never really “got into” them. Once, though, in a college class, I heard a recording of Cummings reading one of his own poems … and it suddenly made sense! Looks like enormous SMALLNESS was a perfect fit for this publishing house! When You Reach Me was published over seven years ago, but I never had a chance to read it until last month. Wow … I can see why the author received the Newbery Medal for this book (in 2010). It’s also easy to see the influences from Madeleine L’Engle – especially from L’Engle’s book, A Wrinkle in Time. When You Reach Me is a multi-layered story that takes place in one of New York City’s gritty neighborhoods. Miranda is the main character with a friend named Sal who, for some reason, avoids her for most of this story. As the story progresses, Miranda receives three more notes, puzzling in that the note writer seems to know things about her life that no one else knows. Phrases that don’t make sense in the notes become clear as the story evolves. The story’s ending is satisfying, completing a circle that only makes sense once you can see all the pieces. The black-and-white woodcut illustrations sprinkled throughout Joann Johansen Burch’s book about Johann Gutenberg are a fitting way to visually portray the early 15th-century world in which Gutenberg lived. Back in the early 1400s, books were scarce and very, very expensive. This was frustrating for Gutenberg, who – as is typical with youngsters – became impatient when he had to wait for things. Back then, books had to be copied by hand, letter by letter, then illustrated by an “illuminator,” and then sent to a bindery where the pages were painstakingly bound together. 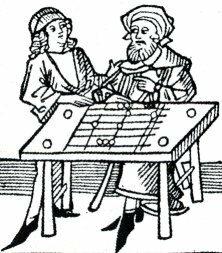 At the age of 16, Gutenberg got a job at a mint in the town of Mainz, Germany, where he learned to make coins as well as jewelry. The methods he learned there, along with his memory of seeing brass punches used to stamp fancy letters onto leather covers of manuscript books, helped inspire him with ideas for creating a printing press. This 64-page book, Fine Print: A Story about Johann Gutenberg, may have been written for children, but it makes a fascinating read for adults too. Illustrated by Kent Alan Aldrich, the book was published in 1991. While looking through an online list of popular ABC books (courtesy of Children’sBooksGuide.com), I saw over 40 titles, most of which I’d never heard of. Only one of the ABC books I listed yesterday – Prairie Primer – was one that I’d actually held in my hands. Similar to I Spy: An Alphabet in Art (see yesterday’s post), Alphabet City (by Stephen T. Johnson) uses art in unusual ways. But whereas Alphabet in Art contains reproductions of classic paintings by master artists like Van Dyck, Magritte, and Rousseau, Alphabet City is avant garde in its approach. Eric Carle, another hugely popular author for the “younger set” in the book world, wrote an ABC book called Eric Carle’s ABC. Filled with collage-type illustrations, each page has a capital and a lower-case version of the same letter – designed to match. And on each page you’ll find a creature – whether insect or mammal, reptile or fish – representing that page’s letter (as in eagle for “E” and crocodile for “C”). … It’s a very good place to start. Don’t you agree? After a long hiatus from regular (or at least more frequent) posts to this blog, I decided it might be a good idea to focus on the basics for a while. So for the last couple of days of June, I’m going to focus on alphabet books – books that teach kids their ABC’s. Then I’ll be graduating to nursery rhymes, Mother Goose, easy readers, then chapter books, and then … I’m going to begin an entirely new category. 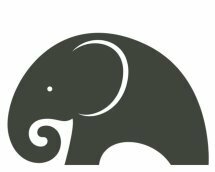 From the very beginning of this website, over seven years ago (yes, seven LOOONG years ago), I’ve wanted to … someday … have a section that’s devoted entirely to the topic of homeschooling, and the books that families use while homeschooling. It’s a subject dear to my heart, since I once homeschooled my own son. And for many families, I firmly believe that it is the best possible choice for their children. But for now, in this post, I’m going to focus only on ABC books. Listed below are the titles of three favorites, each with brief descriptions. More will follow tomorrow. Animalia (by Graeme Base) is first on the list. As a big fan of his book, The Water Hole, I’m happy to include his ABC book here. Similar to the illustrations in Water Hole, the drawings in Animalia are rich in color as well as in content. The longer you gaze at the drawings on each page, the more layers you see. Images pop out in the background. Just flipping through the pages of this book can easily keep a child occupied for hours. 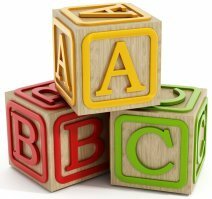 Prairie Primer: A to Z (by Caroline Stutson) is an ABC book I first read while going through a class on children’s literature in the fall of 1996 – soon after the book was published. The lilting cadence of the rhyming words as you read them aloud (or in your head) go well with the nostalgic feeling you get when you turn the pages. I still have the book. I Spy: An Alphabet in Art (devised & selected by Lucy Micklethwait) is a book any art lover would cherish. As an art lover myself, I found it fun to leaf through the pages, seeing paintings by Van Eyck, Vermeer, and others in a whole new light. Well, it has DEFINITELY been too long since I last posted here … close to a year now! Mattick’s motivation for telling this story is compelling, for she is the great-granddaughter of Captain Harry Colebourn, the man who bought the bear cub that eventually become the inspiration for Winnie the Pooh! Here's a short video about the book, narrated by the author. Today was Read Across America Day. In fact, while tutoring a student at the library this afternoon, I saw a lot of kids celebrating by wearing “Cat in the Hat”-style hats and listening to Dr. Seuss books. Kids in the audience at Tillicum Elementary School in Lakewood, Washington, were thrilled to meet the Seattle Seahawks’ wide receiver, Jermaine Kearse, and hear him read Dr. Seuss’s One Fish Two Fish Red Fish Blue Fish. Look for more news on celebrations all across the country as America celebrates National Reading Month! And while you’re at it, check out my own page on Dr. Seuss here. A couple of months ago, I started researching the background of the author of one of my favorite children’s books: Holly and Ivy. Not only did I learn what an amazing woman Rumer Godden was, but I realized how good several of her other books are too. One theme that runs strongly through each of her “doll” books is WISHING. In the book Impunity Jane, Impunity Jane wants – more than anything else in the world – to be carried in someone’s pocket. And after four generations of living in a dollhouse, gathering dust, a 7-year-old boy (the cousin of her current owner) “hears” her wish and sneaks her out of the house in his pocket. Candy Floss is about a very small doll that lives in a coconut shy at a fair. She sits atop a spotted horse named Nut and brings good luck to Jack, the owner of the coconut shy. That is, until Clementine, a spoiled little rich girl steals her and tries to make her into HER doll. Eventually Candy’s wish to be back with Jack gets through to Clementine, and she returns the doll. The experience changes the girl more than the doll … for the better. And Holly, in Holly and Ivy, is a true Christmas doll, with a red dress and green socks. Her wish to be purchased as a Christmas gift for a little girl and Ivy’s wish for a home of her own (and a grandmother) combine to form some powerful “magic.” The story, of course, has a happy ending. I just started reading the first of Godden’s two autobiographical books last night and haven’t been able to put it down. After I finish A Time to Dance, No Time to Weep, I plan on reading the second one: A House with Four Rooms. I’ll soon be adding a new series of pages to this site – short biographies of children's book authors. I think the first one will be about Rumer Godden. In the early 1960s, a very young silverback gorilla was captured in the Democratic Republic of the Congo (DRC) in Africa and transported all the way to the northwest corner of the United States, to the town of Tacoma, Washington. I’m not sure why he didn’t end up in a zoo, but he didn’t. Instead, he ended up living over half of his life in a shopping mall – 27 years, to be exact. He spent those years living by himself in a concrete cell, on display for the world to see. 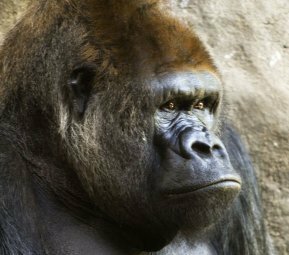 In 1994, he was moved to Zoo Atlanta, where he lived out the rest of his 50 years with other gorillas in a habitat that allowed him a lot more privacy than he had in Tacoma. There, he sometimes painted, signing his work with a thumbprint. I listened to the author of the book, Katherine Applegate, talk about her reasons for writing the story on a National Public Radio podcast that aired in 2013, shortly after her book had been named winner of the 2013 Newbery Medal. So far, I’ve only read the first few pages of the book, but what I HAVE seen makes me want to read more! Over the past few months, I’ve become a fan of Precious Ramotswe through Alexander McCall Smith’s series of books about the owner of the “No. 1 Ladies’ Detective Agency” in Gaborone, Botswana. So when I heard that Smith had started a series for young people, I was very happy. So far, there are only two books in the series – The Great Cake Mystery and The Mystery of Meerkat Hill. But on October 21, 2014 (just over a week from now), the third book in Smith’s young readers’ series will become available: The Mystery of the Missing Lion, a story about an “actor” lion that goes missing while Precious is visiting her Aunty Bee at a safari camp. Precious learns some important things about herself in the first book, including the fact that she’s good at detecting when people are lying … a skill she puts to good use as a detective in her own agency later, as an adult. She comes up with an ingenious idea to find the real culprit behind the missing desserts at school. In the second book, a meerkat helps Precious and her friends find a missing cow. The writing style in these books is much less complex, but I definitely recognized Smith’s style. It’s not written “down” to kids, just simpler, with thought-provoking questions here and there … similar to how a teacher reading a book to her class might occasionally stop and ask questions, encouraging kids to “step into” the story. The illustrations alone make each of these books a collector’s item. Iain McIntosh uses two colors throughout – black (and gray) and orangey-brown – in illustrations that look like woodcuts. Guides at the back of each book describe the geography and people of Botswana, and even explain how to pronounce the word “Mma” that comes before each mention of Ms. Ramotswe’s name. Guides for the reader and the teacher (Curriculum Connections) are at the back, along with a recipe (a different one for each book). Why I said Paris instead of France, I don’t know. The idea of a country filled with unusual animals like kangaroos and koala bears no doubt influenced my second choice, but why Paris? What does a 7-year-old American child know about that city anyway? Regardless, over the years, my interest in all things French hasn’t waned. So I’ve enjoyed reading Liz Sonneborn’s Enchantment of the World™ book, France. Published by Scholastic in 2013, the book begins with the story of France’s greatest hero (actually heroine) – Joan of Arc. Through the use of many photos and a few maps, the book covers the history, culture (past and present), and a chapter on what it’s like to “grow up French.” There’s even a recipe for Quiche Lorraine! 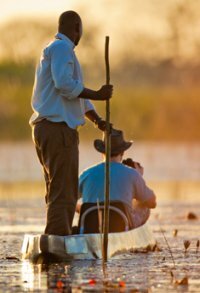 My interest in Botswana, on the other hand, has occurred only recently. It began after reading a couple of books by Peter Allison, a safari guide who’s led tours for many years in Botswana. And now I’m reading a fun series about a woman detective in Botswana, Precious Ramotswe of The No. 1 Ladies’ Detective Agency, written by Alexander McCall Smith. Botswana, another “Enchantment of the World™” book, was written by Sara Louise Kras and published by Scholastic in 2008. The country’s origin is fascinating, largely because of its first president – Seretse Khama. Filled with photos and maps, this book would make an excellent resource for any child writing a report, but is interesting enough to read just for fun. Impressionist paintings are one of my favorite forms of art, so I guess it makes sense that Claude Monet is one of my favorite artists. So, of course, I enjoyed looking through Eyewitness Books’ Monet (by Jude Welton, published by Dorling Kindersley in 1992 in association with The Musée Marmottan in Paris). Considered revolutionary for his time, Monet turned his back on traditional “classical” painting and pursued plein air (open-air) painting through the mentorship of landscape artist Eugène Boudin. That was in the 1860s. For most of the following decade (1871-1878), Monet spent a lot of time in Argenteuil (a riverside suburb 15 minutes from Paris), where he enjoyed many weekends sailing. He produced more than 170 works there, mostly of his wife and son in their garden or nearby meadows, and local river scenes. One of his most famous works, The Water-Lily Pond (painted in 1899), was done at Giverny, six years after establishing his water garden there. 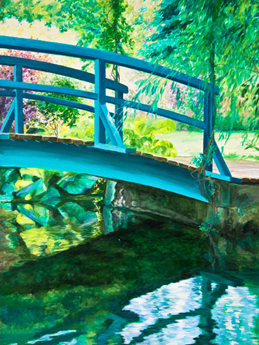 Four years after completing the painting, Monet added a trellis over the bridge and draped it with wisteria. In addition to his water lily series of paintings, Monet created several other series – sets of works painted of the same scene in different lighting, at different times of the day. These included Rouen Cathedral, Haystacks, Poplars, and Mornings. Today, visitors to Paris’ Musée de l’Orangerie can view eight of Monet’s famous water lily paintings (Nymphéas), displayed along the walls in two oval rooms. The display opened in May 1927, just five months after Monet’s death. DID YOU KNOW … Monet made a good living drawing and selling caricatures as a teenager? DID YOU KNOW … Monet’s love for intense colors and bright light began in Algeria, while serving in the French army? DID YOU KNOW … authorities agreed to halt trains while Monet worked on a series of 12 images at the Argenteuil station? His focus: steam. DID YOU KNOW … Monet often painted while on board a studio boat? These two lines start a monologue by a character named Jacques in William Shakespeare’s comedy As You Like It. In DK Publishing’s Eyewitness Book Shakespeare (by Peter Chrisp), readers see photos of the bard’s birthplace in Stratford-upon-Avon, where he was born into a prosperous middle-class family. Other topics include: Queen Elizabeth’s court, Lord Chamberlain’s Men (the name of a theater company with which Shakespeare performed and for which he wrote plays), and his return to Stratford after writing his last play, The Tempest, in 1611. Each topic is illustrated with combinations of photographs, paintings, and diagrams, laid out on double-page spreads. One spread, titled “Plague and poetry,” says that London’s playhouses were required to remain closed if more than 30 people had died in one week. Between 1592 and 1594, the playhouses were closed for over two years. Actors left London to perform elsewhere, and Shakespeare began writing poetry. 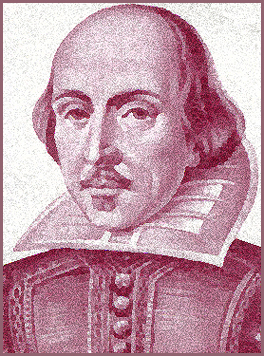 Shakespeare wrote almost twice as many comedies as he did tragedies – 17 compared to 10. He also wrote 10 historical plays (focused on several different kings), three Roman plays, and four romances – sometimes called “tragicomedies” – which include The Tempest and The Winter’s Tale. Shakespeare’s final years (1611-1616) were spent back in his hometown of Stratford-upon-Avon, where he lived in the house he’d bought in 1597: New Place, the second-largest house in town. DID YOU KNOW … that since females were not allowed to act on stage in England, boys performed the parts of girls and women in plays? DID YOU KNOW … children living during Shakespeare’s time had to make their own pens out of goose quills before they could learn to write? And that they had to balance everything on their laps in school, since there were no desks? DID YOU KNOW … people often sang as they worked, whether they lived in the royal court or a peasant’s cottage? This first sentence in Dorling Kindersley’s Eyewitness Book Music (by Neil Ardley) sets the tone for a fascinating exploration of music in all its forms. Starting with the different types of vibrations made by different instruments (“Seeing sound”) and ending with a glossary of musical terms, the book does an excellent job of portraying instruments in a variety of ways. "Bags of sound" has photos of several types of bagpipes, a harmonica, and an old Italian accordion. "Beginning of brass" shows a photograph of a natural horn – an East African instrument made from a gazelle horn that’s played by blowing into a carved opening at the side. One of my favorite sections is "From pears to whole fishes." The focus of these pages is one of the oldest musical instruments: lutes. Music says the lute dates back 4,000 years and is the ancestor of the violin and guitar. It had a lot more strings than either of those newer instruments – sometimes as many as 13 PAIRS! Near the end of the book, a section called “Who’s who?” gives mini-biographies of 30 composers, stretching from Italian Baroque composers Claudio Monteverdi (1567-1643) and Antonio Vivaldi (1678-1741) to Russian modernists Sergei Prokofiev (1891-1953) and Dmitri Shostakovich (1906-1975). 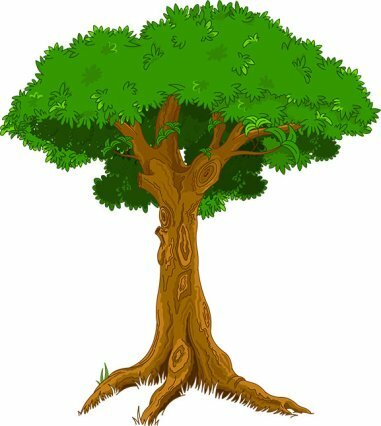 DID YOU KNOW … that Australian Aborigines make a didjeridu by burying a long eucalyptus branch in the ground so that termites can bore out the middle? DID YOU KNOW … that many instruments in South and Central America originated in Africa? DID YOU KNOW … the guitar is the most popular instrument in the modern world? DID YOU KNOW … mu-yus (“wooden fish”) – instruments that originated in China – are symbolic of ceaseless prayer because fish never seem to sleep? Even if you’re not a “dog person,” I know you’re very familiar with these critters. Personally, I’m more of a “cat person,” but there have been a couple of dogs in my life that I was very fond of. Kayo – a pug/dachshund mixture – was the smartest of the two. He’d fetch things and was very friendly. So much so that he “left” with some neighbor kids one day. Peppy, a black miniature poodle, was the other. He was there at least eight of the summers we visited during my teens and early 20s. Barked a lot and liked to follow the chickens around the yard, but a very happy and lovable dog. Overflowing displays of affection and loyalty are just two reasons people have dogs. But for the sake of this post about the Dorling Kindersley Eyewitness Book Dog (written by Juliet Clutton-Brock), I’m going to share some facts I learned about these animals in this book. (By the way, as with the Gorilla book I covered on Friday, the photos and illustrations in this book are fantastic!) There’s also a glossary at the back. All dogs, according to Dog, are descended from wolves. But through “artificial selection” over thousands of years, different breeds developed different qualities. For instance, greyhounds now have far keener eyesight and foxes have more acute hearing than wolves do. African jackals and North American coyotes are social hunters, as are wolves. They travel in close-knit family groups. Asian dogs include dholes and raccoon dogs. 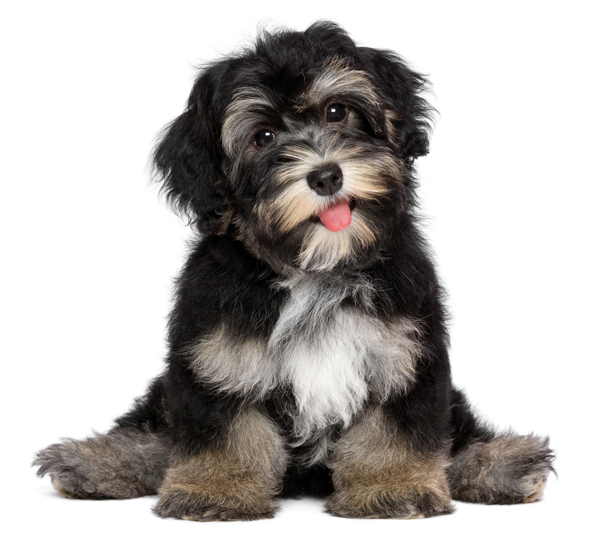 Herding/sheepdogs (collies) … Helpers (German shepherds) … Hounds (beagles) … Terriers (Airedales)… Sporting (spaniels) … Nonsporting (Dalmatian) … Working (Siberian Husky) … Toy (Bichon Frise). DID YOU KNOW … there is a dog that can’t bark? It’s an African wolf dog called the basenji. DID YOU KNOW … that more than three times as many households own dogs in the United States than in Germany and Switzerland? DID YOU KNOW … one of the oldest breeds of dog is the greyhound? DID YOU KNOW … there was a dog that lived almost 30 years? He was an Australian cattle dog named Bluey, who lived to age 29½. These are three ways you could describe primates. Chimps are the smart ones, gorillas look scary, and some types of lemurs – especially those with long fluffy tails – look more like stuffed animals than wild creatures. If you’ve ever looked through the nonfiction section of the children’s section in a library, you’ve seen Eyewitness Books by Dorling Kindersley. Their topics cover countries, animals, sports, art, science … you name it. There are currently over 130 titles in the series. Looking through one of these books is fun reading, too. Your child might even decide to read it for fun instead of just for that report he or she has to do! Gorilla, Monkey & Ape, by Ian Redmond, covers just about everything you could think of related to monkeys and apes … and their close relatives. Looking through this book, I learned a few things I didn’t realize before. For instance, I never knew that lemurs are primates! Apparently, lemurs, bush babies, lorises, pottos, and tarsiers are considered primitive primates, or prosimians. Their brains are smaller than the larger primates like chimpanzees and gorillas, but they’re very well adapted to living in trees and getting around. If you’ve ever seen the Walt Disney movie Madagascar, you know what lemurs look like. (The movie, Life of Pi, has them too, but in non-cartoon form.) One type of lemur (the aye-aye) feeds by prying out grubs from the bark of trees, similar to a woodpecker! Mouse lemurs are small enough to sit on a human thumb, while the biggest are the size of an orangutan. Many New World monkeys (primates in Central and South America) have long tails for grabbing onto branches while they swing from tree to tree. 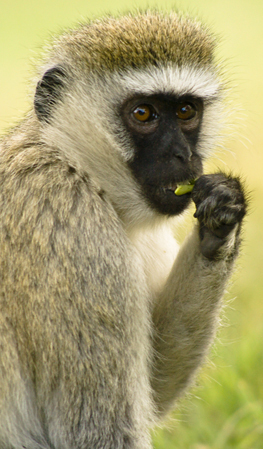 Old World monkeys (primates in Asia and Africa) include macaques, gibbons, chimpanzees, orangutans, and gorillas. The last three on that list are apes – with no tails. Interesting things you never knew ... who knows, this could come in handy sometime! DID YOU KNOW … that young chimpanzees love to be tickled? 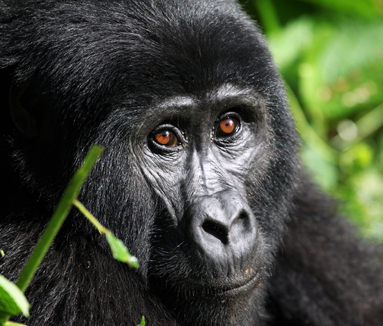 DID YOU KNOW … there was a gorilla named Koko who learned how to communicate with sign language? DID YOU KNOW … that Koko turned 43 today? She was born in San Francisco and was named Hanabiko (fireworks child). DID YOU KNOW … the eye of one type of tarsier (a nocturnal prosimian) weighs more than the animal’s brain? Over the next week, I’ll be posting on three more books in this series. In less than two weeks, world-famous children’s book author/illustrator Eric Carle will turn 85. But even at this advanced age, Carle is FAR from being done with his career. Just take a few minutes to browse through Carle’s website, The Official Eric Carle Website, and you’ll realize that Carle is still extremely involved with the world of publishing as it relates to kids. In 2002, Carle and his wife, Barbara (Bobbie), opened the Eric Carle Museum of Picture Book Art in Amherst, Massachusetts, where events celebrate children’s books all year long. The museum’s website posts info about graduate courses in writing for children and in children’s literature. Every Monday in July and August, from 1:30 to 2:30 p.m. EDT, museum guests’ children (ages 4-11) can participate in the Summer Reading Buddies program with Bright Spot Therapy Dogs. For short blocks of time (15 minutes each), the dogs will become gentle listeners to children reading aloud, helping them develop fluency and strengthen their confidence in reading. Advance sign-up is required. Call 413-658-1114 or email courtneyw@carlemuseum.org to sign up for a date and 15-minute time block. SPACE IS LIMITED. I am a huge lover of animals as well as puzzles. Which must be why I fell in love with Graeme Base’s book The Water Hole when I first read it soon after it was published in 2001. My son was 2 at the time and I felt that it was such a good book – more than just some pretty pictures and clever words (such as hidden animals and a deeper message that makes you think about it for a long time after reading it) – that I knew it was worth buying. Since then, I’ve learned that hidden messages, puzzles, and sometimes even mysteries are hidden throughout most of Base’s books. His third book, The Eleventh Hour: A Curious Mystery, is a story throughout which a cleverly disguised mystery is woven. At the end of the book, the answers to the clues (and a cipher) are sealed. From what I’ve seen from some reviewers on Amazon, it’s worth working hard at solving the puzzles yourself BEFORE resorting to peeking at the answers. Base’s most famous book (his second one) came out in 1986: Animalia. Twenty-two years later, Penguin Books created an Animalia coloring book. And in 2007-08, the book showed up on TV in two separate series, each containing 20 episodes. The Art of Graeme Base, written by Julie Watts, is a 244-page biography of Base’s life as well as a showcase for original art and photos, several of which have never been published. From his early years, when he made pop-up cards and homemade board games, through his teens when he was a rock musician, the book reveals fascinating things about the author's life. 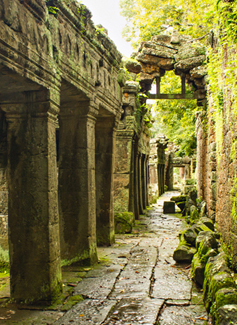 I just discovered that Base (who turned 56 earlier this month), is coming out with another book six months from today: The Last King of Angkor Wat. In the story, Tiger, Monkey, Water Buffalo, and Gecko compete with one another for that most coveted position: king. Along the way, as their weaknesses are revealed, the question arises: Will ANY of them be good enough to be king? In anticipation of National Poetry Month, which starts on Tuesday, I wanted to share with you two poems from one of my favorite poets, Robert Louis Stevenson. The first brings back precious memories of days spent at the beach (Stinson Beach in Marin County) with my husband and son. 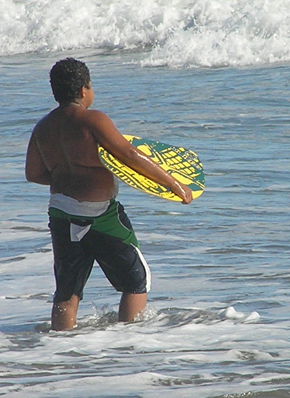 My son was 10, getting ready to surf at Stinson Beach, when I took the picture shown below. In those “innocent times” (which I truly miss these days, now that my son is 15 and sailing some rough waters), I have memories of my son happily sitting next to a bucket while digging up sand and filling it as full as possible with the wet, goopy stuff. The second poem is one that brings back memories from my own childhood, since I remember being able to identify with the imaginary world Stevenson conjures up here. Whether you’re teaching kids in a large classroom or at the kitchen table in your home, you’ll find some great ideas for working poetry into everyday life on this page. In addition to tips on how to help prepare your students for Poetry Month, you’ll see ideas related to reading, writing, and a variety of other activities … like wrapping poems as gifts or creating a poetry book display for your school’s library. I found the “success stories” from previous years in schools across the country especially interesting. According to a post on Mo Willems' blog three weeks ago, he's on sabbatical for the year. "While I will be making various appearances in Europe and beyond," he says, "mostly I'll be spending time at the home base in Paris, France drawing and doodling." Take a look at some of his doodles here. If you visit his blog, you'll also learn about an exhibit he currently has going in Seoul, Korea. Another exhibit, which includes some of Willems’ work – Beyond Words: The Artistry of Illustrated Children's Books – will be on display at the Oddfellows Gallery in Hattiesburg, Mississippi April 9-11, 2014, to coincide with the city’s annual Children’s Book Festival. One special guest at the festival will be Newbery Medal-winning author Christopher Paul Curtis. Willems has a VERY fun website. One of my favorites there is his Play the Elephant & Piggie Dance Game. Finding the best new books for kids can be challenging. This page will make it easier for you. Continue reading "New Books for Kids"
Kate DiCamillo is one of my favorite authors. I fell in love with her storytelling when I saw the movie Because of Winn-Dixie several years ago, and her book The Miraculous Journey of Edward Tulane touched me deeply, helping me let go of an old grief that I didn't even know was still there! Her book, The Tale of Despereaux, was one of my son's favorite books, so he's a fan too. So I was very glad to see that Kate has just been named as National Ambassador for Young People's Literature. Her humor comes across in this interview as much as it does in her writing. Enjoy! By the way, if you have never yet read any of her books, I encourage you to do so. Their messages will stay with you for years. Two months ago, I started working as Assistant Editor for an international travel magazine, a publication filled with content written by subscribers. So I was excited when I came across Lisa Manzione’s series of Bella & Harry picture books – books that take young readers on tours of dozens of countries around the world. Each Adventures of Bella & Harry book is written by Manzione and illustrated by Kristine Lucco, and focuses on the travel adventures of Bella and Harry – two Chihuahuas who happen to be brother and sister. 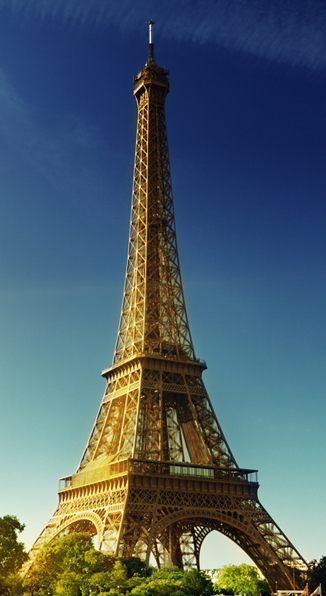 The first book in the series – Let’s Visit Paris! – appeared on bookshelves two years ago, in November 2011. Since then, nine more books in the series have appeared, each focusing on a different city. Judging by at least two reviews I saw on Amazon, these books help get children – as young as 8 years old – interested in traveling and exploring other cultures. The two latest books in the series are Let’s Visit Istanbul! (published April 1, 2013) and Let’s Visit Jerusalem! (published September 1, 2013). Masada, the Wailing Wall, the Orkatoy Mosque, the Grand Bazaar … these are only a few of the sights Bella and Harry see while journeying through these ancient cities. The book about Istanbul received the 2013 Book of the Year Award for the Educational Picture Books category, bestowed by the Creative Child Awards Program. I wouldn’t be surprised if Manzione’s Jerusalem book gains recognition as time goes on as well. Four new destinations will be featured in 2014: Dublin, Maui, St. Petersburg, and Vancouver. Manzione got the idea for this series about six years ago, when she realized that her teenage son couldn’t even identify France on a map. Our children today are “geographically challenged,” she says, and she hopes that the children who read her books will become curious to learn more about other cultures and countries when they’re grown. I noticed that Examiner.com interviewed Manzione in October 2012. I’ve included an excerpt from that interview below, but I encourage you to read the rest of the interview here. If you could go along with Bella and Harry, where would you choose to go next? 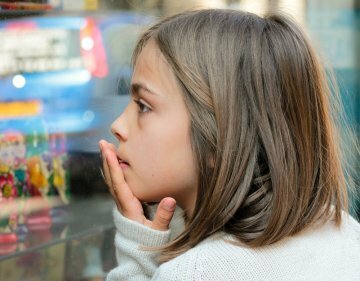 Do you remember having to act “just so” when you went out in public as a child? Having to wear clothes that were uncomfortable, but looked good? Then maybe you’ll be able to commiserate, just a little, with Mr. Tiger. In his newest book, Mr. Tiger Goes Wild, Peter Brown shows you how difficult it is for Mr. Tiger to wear a suit and act properly at all times. The ending will bring a smile to your face (as will the rest of the book – beautiful illustrations, done in muted earth tone colors). Published just two months ago, the book is already getting rave reviews on Amazon. Brown’s illustrations first started appearing in children’s books in 2005, and have been appearing every year since. Earlier titles include Children Make Terrible Pets, The Curious Garden, and You Will Be My Friend! I’d read one of the books he illustrated several months ago – Creepy Carrots. Very fun book, even for adults! Don’t miss Brown’s blog either! His most recent post has to do with this same book: Mr. Tiger Gets Styled. It’s official … Dave Kinney’s newest book in his “Wimpy Kid” series is out: Hard Luck. Released today by Amulet Books, Hard Luck has already earned 9 reviews on Amazon – 7 of which are 5-star. In this book – #8 in the series, Greg Heffley’s best friend, Rowley, has ditched him, leaving him with the hard task of finding a new friend. And in middle school, that’s not easy. If your child hasn’t already discovered this fun series, there’s no need to go back to the beginning to get them started. He or she will enjoy Hard Luck as much as those who have been following Greg’s adventures from the beginning. When Kinney’s dream of becoming a newspaper cartoonist didn’t pan out, he started developing the idea for the Wimpy Kid series. Kinney’s got a great website – check it out sometime! Kinney has also created an online gaming site for kids: Poptropica. Melissa Taylor of Imagination Soup has done it again. She's posted about something that I think is amazing: turning a 2D drawing into a 3D doll!! Cryoow! dolls is the name of the product, and the example she mentions in her September 18th post shows the doll created by her own 8-year-old daughter. 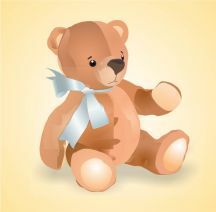 The post goes on to talk about different ways you can use the stories your child creates for their dolls. One suggestion she has is using a book by child psychiatrist Robert G. Ziegler, M.D. The book is Homemade Books to Help Kids Cope. 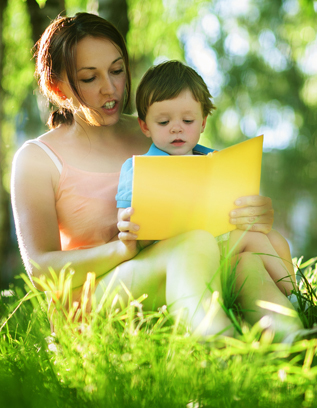 The book shows parents how to create personalized books for and with their children. They can be written and designed to fit any situation, and are a good way to help children deal with difficult transitions in their lives, such as parents divorcing, death, moving to new neighborhoods, etc. Check back here over the next week for at least one or two more posts on ways to help promote literacy and learning with your children. Over the next few weeks, look for more helpful links, as well as tips and suggestions on ways to celebrate literacy this month! Surviving middle school is easier with books like this. The reviews I saw about the book on Amazon seem to confirm that. Of the 67 reviews, 50 are 5-star and 11 are 4-star! Several of those reviews are from teens, too. It came out as a reprint in June of this year. Middle School: How I Survived Bullies, Broccoli, and Snake Hill is the fourth book in James Patterson’s Middle School series. In the book, main character Rafe Khatchadorian looks forward to having fun at summer camp … until he discovers that it’s summer SCHOOL camp. Rafe makes friends quickly with some trouble-making cabin mates, but also learns to appreciate a less-than-popular boy during the course of the book. Co-author of the book is Chris Tebbets; illustrator is Laura Park. Together, with Patterson, they’ve created yet another winner that you won’t want to miss … that is, if you haven’t read it already! Kitty, fish, snail, chicken … wait, a BLUE chicken? What do fish, snail, chickens, and kitties have in common? They’re all main characters in Deborah Freedman’s books. The most recent of these books – The Story of Fish and Snail – was published in June 2013. Snail loves to listen to stories read by his friend Fish. That is, until Fish decides Snail needs to experience pirates first-hand, instead of just listening to stories about them. In September 2011, Blue Chicken made its debut. The story starts out with an unseen hand painting a barn scene. The fun starts when a chicken decides she should help out. When she accidentally spills a pot of blue paint, EVERYTHING turns blue … a messy, watery blue. Kids love the way the barn animals “mess things up” … similar to the way they do sometimes. And seeing how everything gets cleaned up at the end is just as fun. Freedman’s first book, Scribble, came out in May 2007. All 5 Amazon reviews are 5 stars. The story is kitty vs. princess ... and a tangled scribble. Be sure to visit Freedman’s website. She’s got a page devoted to resources for children’s book authors and illustrators, another page filled with links to favorite websites and blogs about children’s literature, and yet another page with links to info on how the author does school visits, downloadable activity sheets and coloring pages (PDF format), reading suggestions, and lesson ideas for each of Freedman’s books. Stefan pointed out that the camp was NOT a Polish extermination camp, but rather a GERMAN NAZI camp, located in occupied Poland. I apologize not only to Stefan, but also to any others who may have been offended by this wording. My hope is that by bringing people's attention to books on this subject, the next generation (namely, today's children) will have a greater respect for those who suffered and will - ideally - help ensure that the atrocities that occurred during the Holocaust will never happen again. Thank you, Stefan, for giving me the chance to correct this. Boys and literacy CAN go together! Had to share this pin with you! 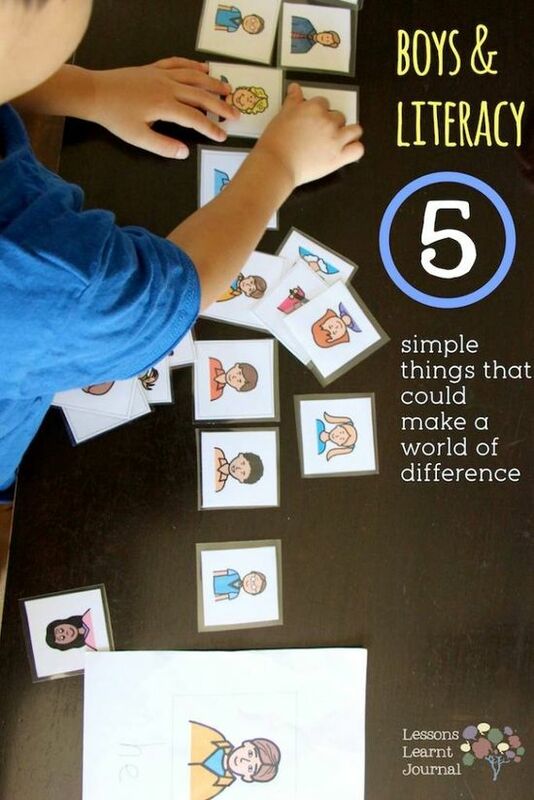 Looks like some great ideas to help interest young boys in reading. My husband said that comic books were what got him into reading. He was dyslexic (and probably still is a little), but because he was constantly reading comic books ... he loved the pictures ... his brain eventually learned how to read correctly. Amazing, isn't it? My husband now is the most prolific reader I know. Watch for more of my favorite Pinterest posts as I find them. Lincoln Tells a Joke: How Laughter Saved the President (and the Country), written by Kathleen Krull and Paul Brewer, illustrated by Stacy Innerst, and published in April 2010. At age 19, Lincoln liked swapping jokes and stories with folks at the general store in New Salem, Illinois. The local judge found him so amusing that he invited Lincoln to court to comment on current cases. That was where Lincoln saw that the power of words could put someone in jail or free them. One month after becoming president in 1860, the Civil War broke out. And five days after it ended, in 1865, Lincoln died – assassinated at the age of 56 while watching a play with his wife, Mary. So basically, the country was at war during his entire presidency. Throughout his years in office, Lincoln’s love for laughter helped him weather the many painful trials he underwent during the Civil War. Just as it had done for the first five decades of his life. Electric Ben: The Amazing Life and Times of Benjamin Franklin, written and illustrated by Robert Byrd. Published in September 2012. Benjamin Franklin was another amazing person in history. He lived about a century before Lincoln, but lived to the ripe old age of 84 (not common at all back then). He began inventing things when he was 11, with a pair of wooden swim fins. • Londoners asked Franklin to start a swimming school while he was there in his late teens. • He owned his own print shop at the age of 22. • Inventions included the Franklin stove, lightning rod, bifocals, and a long-armed pole to reach objects on high shelves. NOTE: The author lives in Philadelphia, yet never knew much about Franklin until writing this book. A Hero and the Holocaust: The Story of Janusz Korczak and His Children was written by David A. Adler, illustrated by Bill Farnsworth, and published in 2002. Korczak was born in Warsaw, Poland in 1878. He was raised by wealthy parents – Jewish, but not religious. After losing his father to a mental breakdown and then death when he was a teen, Korczak began writing sad stories and poems. Later, after becoming a doctor, Korczak became the director of a new Jewish orphans’ home. He wrote stories for children and books of advice for adults. When the Nazis invaded Poland and moved the Jews to “ghettos,” Korczak refused to wear the Star of David armband, resulting in his arrest in 1940. (A friend later secured his release.) On August 6, 1942, the Nazis came for Korczak’s orphans. Throughout their journey to the train station and then to Treblinka, a German Nazi camp in occupied Poland, Korczak stayed with them. Right before boarding the train, a Nazi commander recognized Korczak and offered to let him go free, but Korczak refused to leave the children. On her first night there, Luba heard the sound of crying and discovered 54 Dutch babies and children in a field, where they’d been left to freeze to death. This book tells the story of how Luba managed to not only obtain food and clothing for the children, but also how she persuaded scores of adults to keep the children’s presence a secret. When the British liberated the camp on April 15, 1945, 52 of the children were still alive. The third book – The Boy on the Wooden Box: How the Impossible Became Possible … on Schindler’s List (by Leon Leyson) – hasn’t even hit the bookstores yet! Scheduled for release on August 27, the book was written by the youngest person on Oskar Schindler’s list and is the only memoir published by a former Schindler’s List child. The book has been targeted toward children ages 9 and up. The author (born Leib Lezjon) passed away in January of this year. A graduate of California State University – Los Angeles, Leyson taught at Huntington Park High School for 39 years. He is survived by his wife, Lis, their two children, and six grandchildren. “Touchy-feely” books are a common sight in bookstores now, but in 1940, Dorothy Kunhardt’s Pat the Bunny was a groundbreaker in that genre. That wasn’t the only book she wrote, however. Unknown to many, Kunhardt wrote close to 50 other books for children and adults during her decades-long writing career.Two of those books – Junket is Nice and Now Open the Box – are being reprinted this year. Originally published in 1933, Junket is Nice was re-released just last month by the New York Review Children’s Collection (NYR). Open the Box – first published in 1934 – will reappear on bookshelves later this month (August 20), also published by NYR. If you’re like me, you’re probably wondering what “junket” means. According to Wikipedia, junket is a milk-based dessert, made with sweetened milk and rennet (the digestive enzyme that curdles milk). In other words, like custard. In Junket is Nice (Kunhardt’s first), an old man with a red beard and red slippers is eating a huge bowl of junket. Everyone is wondering why, but only one little boy has the answer. This book of nonsense also includes the element of repetition – always a hit with children. Now Open the Box features a tiny circus dog named Peewee who doesn’t know any tricks, but “never mind, he is so teeny weeny that everybody loves him.” But then, something unexpected happens that threatens to bring Peewee’s career under the Big Top to an end. According to Edwin Frank, editor-in-chief of New York Review’s Children’s Collection, “These books are very important in the history of American illustrated children’s books. In a sense, Dorothy Kunhardt invented the practice of writing books in a child’s state of mind. Instead of talking down to children, she engaged their imagination. One of her children, Edith (for whom she wrote Pat the Bunny), has written 70 children’s books of her own. Influenced by her mother’s example, she wrote and illustrated her first homemade book – about Rosie, a hippo that lived in the Central Park Zoo – in elementary school. Looks like Erin Stead and Julie Fogliano have teamed up to create another winner this year: If You Want to See a Whale – a book aimed toward 4- to 7-year-olds. Published less than 3 months ago, the book has already received some rave reviews and descriptions like: stunning, lyrical, sweet, poetic, comforting, quiet, a little slice of heaven. The dreamy quality of the illustrations combined with the lilting text make this is an ideal bedtime book to share with your young ones. Ribbit! is the name of a book released on March 26 of this year. Aimed at 3- to 7-year-olds, Ribbit! is about a pink pig trying to make friends with a band of frogs, who aren’t very accepting of him. Written by Rodrigo Folgueira and illustrated by Poly Bernatene, the book has earned 22 5-star reviews on Amazon (out of 24 total – the other two reviews were 4-star). Any child (or adult) who has felt rejected because of looking different will – hopefully – appreciate the message. The Day the Crayons Quit, by Drew Daywalt and illustrated by Oliver Jeffers, hit the bookshelves just over a month ago – June 27. Twenty-nine of the 34 reviews for this book on Amazon are 5-star. This book, like the others, is for the "preschool set" - ages 3-7. When Duncan opens his box of crayons one day, he’s shocked to discover only letters … no colors. The crayons are mad and “on strike” – anything to take a break from the colors they were born with! Orange and Yellow, for instance, “are no longer speaking.” That’s because they each believe they are the true color of the sun. This very funny book also delivers a powerful message to young readers, especially those who love art and enjoy a little nonsense in their stories. Get Caught Reading in May! It's the last week of May, but the celebration of reading doesn't need to stop on June 1! Visit our Children's Publishing page and read about the "Get Caught Reading!" literacy campaign that's been taking place this month. And don't miss the new items on our New Books page. You'll find brief descriptions of 4 new books there, and a cute video about baby sloths! The growth in sales of electronic books and online reading devices point to huge changes in the world of children's publishing. Learn about changes in the industry and the current best books for kids. Ravioli to chocolate … and everything in between! Did you know that May is National Barbecue Month? And National Salad Month? So why the mention of ravioli and chocolate? Well, I recently came across some food-related books that caught my attention, and because reading is relevant to anyone trying out recipes in a cookbook (and understanding how to follow the directions), I felt it was appropriate to mention these books here. Chocolate: Riches from the Rainforest, by Robert Burleigh, is targeted toward children ages 6-10. It features all sorts of fascinating trivia. For instance, did you know that chocolate was never sold during the summer months until around 1915, when refrigeration became accessible to businesses? At the opposite end of the “deliciousness” spectrum is a book called It’s Disgusting and We Ate It!, by James Solheim and illustrated by Eric Brace. This book is filled with not only interesting (and disgusting) trivia, but also with cartoon-quality pictures. FACT: In the Middle Ages, on days when European Catholics weren’t supposed to eat any meat but fish, they could still eat frog and beaver meat! FACT: Popular American foods in 1776 included: pickled passenger pigeons, squirrel pie, opossum stew, and soup with marigold petals. Roly-Poly Ravioli and Other Italian Dishes, by Nick Fauchald, illustrated by Ronnie Rooney. This book, aimed toward children ages 7 and up, is loaded with helpful tips (including a metric conversion chart!) and detailed information on food, nutrition, and cooking. Illustrations include a large, brightly-colored food pyramid on page 4 and a full page of distinctly-labeled kitchen tools on page 7. Recipe examples include Berry Delicious Semifreddo, Insalata Mista, and Tasty Tuna Bruschetta. 2. Choose your grade level. Funny books get kids reading. And if they’re also a little weird, even better! A 2nd grade girl who attends the after-school program I work with had her nose buried in this book most of the afternoon. I saw the author’s name and realized he was the same guy who wrote the series of baseball books my son liked so much (where Stosh goes back in time whenever he holds an old baseball card). Mr. Burke is Berserk! (written by Dan Gutman and illustrated by Jim Paillot) is the fourth book in the My Weirder School series. So far, Gutman has written 8 books for this series, starting with Miss Child Has Gone Wild and ending with Dr. Nicholas is Ridiculous. Gutman is more than just an author, though. If you visit his website, you’ll see that he’s a person of action. If he sees a problem, he does something about it. Two months from now, on June 25, My Weird Writing Tips will make its debut onto bookshelves all across the country. Gutman says he wrote this book because of the “horrible grammar and spelling” he was seeing in email he received from kids. When you visit Gutman’s website, be sure to check out the puzzle page! Poetry Speaks to Children is a collection of 95 poems, 52 of which can be heard on a CD that comes with the book. Most of the poems were read by the poets themselves, which I thought made the listening experience all the more meaningful. A baby kangaroo is called a joey. (This second poem isn’t on the CD, but proves that the quality of the poems NOT included on the CD is just as good as the audible ones. Join hundreds of others all over the United States on Thursday, April 18 in celebration of Poem in Your Pocket Day. Select a poem you love during National Poetry Month (April). Carry it with you throughout the day, sharing it with co-workers, family, and friends. This year’s poster for National Poetry Month features the line: “Write about your sorrows, your wishes, your passing thoughts, your belief in anything beautiful.” from Rainer Maria Rilke's Letters to a Young Poet. I’ve owned a copy of this book of Rilke’s since my second year in junior college, when this was the textbook my Humanities teacher assigned us. It’s an amazing book, as you can easily see by the comments listed on Amazon.com. Here’s a video showing how folks in Charlottesville, Virginia have celebrated this event in the past. It’s that time of year again – NATIONAL POETRY MONTH. The one that interests me the most is Kidblog – partly because a 6th grade student recently told me she thought it would be a great idea for me to start a blog where kids could record their views of books they’ve read. Three tabs on the home page detail 3 different reasons this website is so great: Built for Teachers, Easy for Students, and Great for Schools. Kidblog helps teachers start classroom discussions, teach “digital citizenship,” and more easily assess writing. Students don’t have to worry about keeping track of user names and can easily find classmates’ blogs in the central blog directory. And school districts love the fact that privacy settings can be customized to match their technology policies. In the days to come, watch for more ideas, tips, and insights on sharing poetry with children … and how to encourage them to share poetry of their own! "Which animal likes cheese and hates cats?" This riddle and 16 others fill out the contents of this book. The illustrations in If Not for the Cat are absolutely gorgeous. Any one of them would look beautiful hanging on a wall by itself. To be able to have 17 of these drawings all in one place, though, should cause any art aficionado and/or lover of children’s picture books to seriously consider purchasing this book. Author Jack Prelutsky has been writing poetry that children love for almost 40 years. (He has a GREAT website, with sections for kids as well as parents. The illustrator of the book happens to also be Prelutsky’s neighbor! Ted Rand used a mix of sumi brush drawings in India ink, traditional watercolors, chalk, spatter, and printmaking techniques for the book. • Try reading these poems to your class as riddles. • Have your students try their hand at writing their own haiku poetry. • Make reading a daily practice – a special time for both of you to look forward to. • Read through the whole book to become familiar with the poems before choosing which one to read to your child. • Choose rhythmic poems and vary your tone to keep the attention of very young children. For more on poetry, check out this page. When I read a description of this book – about the way Roxaboxen’s characters created a special world out of nothing but some sand and rocks, cactus, and a bunch of old wooden boxes, it reminded me of the children I watch every afternoon at a local elementary school. One of their favorite attractions is the hill at the far end of the blacktop playground. They entertain themselves for hours by cracking open rocks to find crystals, digging deep holes, and discovering all sorts of treasures. Rocks, it seems, hold an endless fascination for children. And I guess they did for me too, because even though I wasn’t a collector, I did consider collecting rocks at one time. I only wished they would stay as pretty as they looked when they were wet!! The Arizona desert is the setting for Roxaboxen (written by Alice McLerran and illustrated by Barbara Cooney), and speaking from experience (my grandparents lived in southern Nevada, where we visited every summer and winter for many years), there does seem to be something magical about the barrenness of a desert, especially when you’re around it day in and day out. In the 12 years since it was published, Roxaboxen has garnered 45 5-star reviews – four of which were added within the last three months! This book is a true classic. The Mountain That Loved a Bird, by Alice McLerran, is about “a bird that brings new life to a lonely, barren mountain.” That’s the description Amazon gives it. I love the title. And with Eric Carle as the illustrator (master of colorful collages), I’m even more intrigued by this book. The personification of the mountain works to help people better understand the healing that follows when we express our emotions … as the mountain does when its heart first “melts” with tears of sadness, then with tears of joy. The other book I’m posting about tonight is Roxaboxen, which is about rocks. Mountains, of course, are also rocks – very large ones. But the real reason I wanted to post about McLerran’s book is in honor of my mother-in-law, Mary Jo, who just turned 82 yesterday. McLerran’s website has a page devoted to this book that says adults usually buy this book for themselves. “Wanting to stay with something forever, even when that’s impossible” is how McLerran describes the book’s theme. She says that so far, the book has been translated into 25 languages! Sojourner Truth’s Step-Stomp Stride by Andrea Pinkney, illustrated by Brian Pinkney. Targeted toward children ages 5-9, this story is about a historical figure I’d never heard of before: a woman who not only managed to gain freedom in the North by escaping a series of cruel slave masters, but who decided to do something to help free others from the same horrors she had lived through. Sojourner Truth (formerly Isabella Baumfree) started traveling across the country in the decade leading up to the Civil War, preaching against the evils of slavery and speaking out for women’s rights. She lived to be 86 and is believed to have made a huge impact on the success of the abolition movement. I Have Heard of a Land by Joyce Carol Thomas, illustrated by Floyd Cooper. Written for children ages 7-11, this book focuses on a little-known part of history: African American pioneers settling in Oklahoma during the late 1800s, at a time when land was being offered for free to everyone willing to move there. Drawing upon her own family’s history, Thomas has written powerful verses to tell the story of the mass exodus from the South of newly-freed slaves who were looking for a fresh new start, away from the prejudice that seemed to linger on throughout the South. Back and forth to the cottonwood trees. The soft earthtone oil-wash drawings are perfect for this book, creating an almost dreamlike quality. Meet Danitra Brown by Nikki Grimes, illustrated by Floyd Cooper. She’s not afraid to take a dare. If something’s hard, she doesn’t care. She’ll try her best, no matter what. Listen to how students respond to this book in this video clip.